Perseverance is a common tale in the law community, and very few symbolize that story as does Khaldoun Baghdadi. The partner with Walkup, Melodia, Kelly & Schoenberger was born in Jordan and migrated to the U.S. with his family when he was a child. He never lost sight of his Palestinian roots and could not stem his desire to help his immigrant family and community, so he chose law. Education also played a large part in Baghdadi’s choices. He studied political science and said learning about the civil rights movement as an undergrad student provided extra motivation for making a difference. “Learning how the Civil Rights Movement wasn’t just about marching and demonstration but also about active litigation, and seeing the role that the NAACP, Southern Poverty Law Center played, learning that you can affect real change in the courtroom, was really inspiring to me,” he said. While Baghdadi initially had his sights set on international law, he soon realized it wasn’t what he set out to do. When he began interviewing with such firms, he quickly found out they were just doing corporate law in different languages, he said. For someone who wanted to be in trial and litigation, it just wasn’t the right fit, and he kept looking. He said he felt more drawn to the plaintiff lawyer narrative of working hard and smart and actually knowing your clients. Baghdadi joined the Walkup firm in 1998 and has since become one of the top trial lawyers in Northern California, having obtained several seven-figure verdicts in areas such as product defect, wrongful death, public transit injuries and medical negligence, among others. He has been recognized in the legal community for his achievements in the courtroom as well as his professional and ethical standards. In addition to his individual accomplishments in law, Khaldoun has been active in academic circles and the community. He served as adjunct instructor at UC Berkeley School of Law, where he taught trial advocacy, and served as an adjunct professor at UC Hastings College of the Law. He also taught trial technique, deposition practice and lawyering skills for the National Institute of Trial Advocacy. Baghdadi served the city of San Francisco by way of mayoral appointment to the San Francisco Human Rights Commission, and in 2006, he was elected chair of that body. While Baghdadi was born overseas, he essentially was raised in the U.S. Yet he was taught at a young age to not lose touch with his heritage. Baghdadi attended UC Irvine for his undergrad education and earned his law degree from UC Hastings. After his brief pursuit of international law, he was hired by the Walkup firm, where he fulfilled his goal of becoming a trial lawyer. 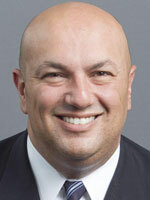 At the time, he hadn’t envisioned he would still be at the firm 20 years later, but he chalked up his lengthy stay to the “guidance and mentorship of a truly exceptional group of attorneys.” As for the future, Baghdadi said he wants to continue to try cases, teach more at the local law schools, and help younger lawyers learn from their mistakes. Baghdadi said he’s developed an approach he learned from trying cases with some of the best trial lawyers in the country. That approach involves both confidence and humility, as well as integrity, sincerity and hard work, he said. Establishing credibility with the defense, being mindful of the jury’s time and being yourself also are crucial when going to trial, he added. Baghdadi said it’s also important for him to never make a promise he can’t keep, recognize the difficulties in his case and address them at the outset, speak a language that jurors understand and have the courage to let the client’s story speak for itself. While Baghdadi has plenty of memorable verdicts and settlements under his belt, he said in terms of his development as a trial lawyer, every case he’s lost has stayed with him; every defeat has left a mark. His first solo jury trial 15 years ago was a medical negligence case in Modesto, a very difficult case to begin with, and the firm had the confidence in him to let him go it on his own. Years later, he tried and won two hip implant cases, saying that’s when he first learned how well a team of lawyers can work together as long as they work hard, combine efforts and not worry about where the credit falls at the end of the day. Another case that Baghdadi perhaps won’t ever forget involved the wrongful death of a child. He said it was probably the most emotional experience he’s ever had in the courtroom. The biggest challenge, he said, was knowing how emotionally raw it stayed for his client and the jurors. “When you’re around that level of intensity of emotion, the things you normally worry about seem to fade away,” he said. “In other words, you’re not so worried about the font on your PowerPoint when you’re talking about the death of a child. Our challenge is to maintain the dignity of the case and afford our client the respect for their loss that they deserve. It’s an unspeakable loss, and so how do you stand for that person in a way that doesn’t diminish it, that doesn’t make it appear as if you’re grabbing or overreaching in terms of damages? Baghdadi revealed a personal watershed moment that he otherwise doesn’t try to advertise. In 2010, his wife Amy went through cancer and chemotherapy, and it was one of the hardest times to reconcile being a busy lawyer and a dad and a husband, he said. And he’ll never forget his partners who supported him no matter what and allowed him to do what he needed to do to help his wife and family navigate through the illness. “She’s now doing well, and we’re so thankful, but that experience sort of helped me distill and refine why we work hard for the people we work hard for,” he said. “Definitely a wake-up call to understand what so many people go through when they try to navigate the health care system. As a seasoned lawyer and teacher, Baghdadi is not averse to handing out advice, and he believes hearing and accepting the musings of an experienced attorney is a good place to start.